Today we’d like to introduce you to Naeemah Ford Goldson, CPO®. Naeemah, let’s start with your story. We’d love to hear how you got started and how the journey has been so far. After graduating college 13 years ago, I didn’t know what I really wanted to do. The thought of running a small business briefly crossed my mind when I saw a picture of myself in a brochure for my university. There was an arrow pointing down at me and the words above said “running a small business”. I thought, yeah right! I had no clue I would be running a small business today. I graduated from the University of Nebraska at Omaha with a major in Broadcasting. I decided to move to Atlanta a few months after graduating because I wanted to work at CNN. I got my foot in the door as a CNN Tour guide. While I was working in tours I received an opportunity to work part-time in CNN Radio. After being there for a year, I realized hard news wasn’t my thing. I had thoughts of starting my own business then, but I didn’t know how, or what it would be. After CNN, I worked at Cox Communications as a Senior Encoding Technician, I basically watched commercials to make sure they were ready for air. After having my first son, I decided not to return to Cox. I was finally ready to go back to work when my son was 10 months old, but I had trouble getting back into the workforce. I had many interviews but didn’t receive any offers. I told my oldest sister how frustrated I was and she recommended I start an organizing business. That’s when the light bulb turned on in my head. I’ve always been an organized person. I’ve always had the patience to help family get organized. Why not try my hand a creating an organizing business? I started my business in 2013, and did really well my first year by doing deals with Living Social and Kudzu to gain new clients. 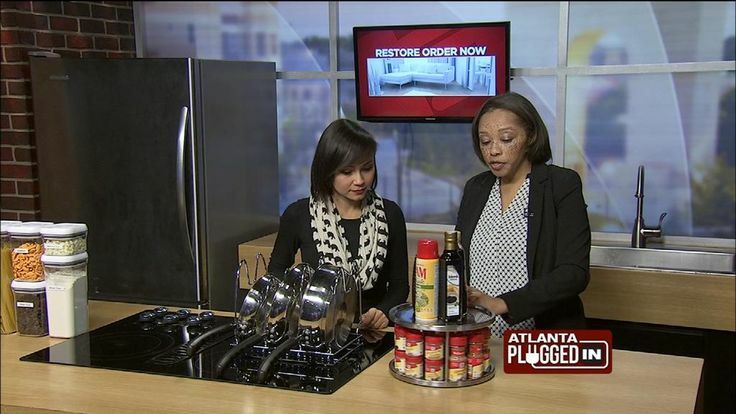 In 2015, I appeared on two CBS46 shows as an organizing expert, and I also entered into a partnership with The Container Store as an organizer for their Contained Home program. In 2017 I appeared in a segment on Morning Express with Robin Meade and Weekend Express on HLN. I’ve also staged a model dorm room at Emory University. There is still so much more that I want to accomplish for my business. It definitely hasn’t been easy. Throughout this journey I’ve had periods of greatness, and periods that are not so great. My first year was awesome, but the second year was slow. Partly because I was pregnant with my second son. I didn’t have enough energy to give my clients the attention they needed. Because of that, I started my YouTube channel so I can offer organizing tips without having to do an actual session. Alright – so let’s talk business. Tell us about Restore Order Professional Organizing – what should we know? My business is Restore Order Professional Organizing. I’m a Certified Professional Organizer® also known as Naeemah Ford Goldson, CPO®. I also hold certificates of study in Chronic Disorganization, Time Management and Productivity, and Attention Deficit Disorder from The Institute for Challenging Disorganization. Which means I’m equipped to work with clients that are facing many challenges that prevent them from being organized. I go into client’s homes and help them get organized. It can be organizing a pantry, setting up a filing system, or clearing out a garage. I also have clients that just want to have their closets or other space redesigned. My husband Eric also plays a role in the business as well. He’s the Media Director and shoots and edits all Restore Order YouTube videos. I’m most proud of my TV appearances because that’s the direction I want to take my business. I want to be in people’s homes without physically being there to teach them how to become organized. Besides my cool logo, I think the drive and determination to keep Restore Order going sets us apart. We’re always trying different things to keep our business in the forefront. My husband Eric Goldson is my biggest supporter. Whether it’s producing an amazing shoot, or just going along with my sometimes wacky ideas… he’s always by my side. My sister Ariel Ford has played a huge role in social media for Restore Order. My mom Beverly Chatmon is the most disorganized person I know! Whenever I visit, I organize something for her. If she wasn’t so disorganized I might not have realized the need for this type of business.